Sorry for the short hiatus folks, but we spent last week in Kentucky introducing the Bug to his extended family. It was a fantastic trip where we interacted with lots of cousins and just wore ourselves out! The Bug was just GO GO GO the whole time with minimal naps…but when he did nap he was ADORABLE (as you can see in this cute photo with Granny). We still have Baked Sweet Potatoes and White Beans to try…but I couldn’t wait to post about this, so we’ll have it tomorrow and let you know how it went over. Based on our other meals, I’m sure he’ll love it. So what’s it going to cost me you ask? $16.95 for a pack of 12 pouches. That’s $1.42 per pouch, which really isn’t that much more than the Stage 2 and Stage 3 of Earth’s Best that you can get at your local grocery store. And trust me, your baby will thank you. The oatmeal with roasted cinnamon applesauce sounds good! My baby is only 7.5 weeks, so we're not at solids yet. But this looks like a great idea when we get there!!! Erin love the tribute to your Dad and your new pic sof your cute son! There are several flavors I'd love for my little one to try. Roasted Bananas and Mango and Pasta with Lentil Bolognese, for sure! These flavors look amazing. I will for sure be trying the squash, yukon gold potatoes and Parmesan, the roasted butternut squash, and roasted pears. Very cool site! My little guy loves sweet potatoes so the Baked Sweet Potatoes will surely be a hit! I think the Peach Rice Pudding sounds delish myself. My Twins would ADORE the Oatmeal with Roasted Cinnamon Applesauce. They love anything with apples. Thanks for the site. I've tried the pear with my little one (and around here you can get it for $1/pouch!). She loved it! I'd like to try the apple and blueberry, I think she would like that a whole lot! Cool! My son is just a few days shy of being 7 months old. He loves just about everything we've given him so far. I don't know if he has a favorite, but he sure gobbles down his sweet potatoes, so I think I'd wanna try the sweet potatoes + white beans. Hi Erin! This opportunity is fantastic! I love peaches, so I hope Kinley does too. Peach rice pudding sounds yummy! She can't eat baby food yet, but it'll be here before you know it. Who knew baby food could sound so good? sapples and blueberries would probably be our favorite! We just picked fresh blueberries in MS this past weekend, and I mashed some to make a smoothie blend for her and she loved it! I think the Pasta with Lentil Bolognese sounds great because it's a recipe you don't see by any other brand. All the flavors look fantastic though so it was hard to pick one! 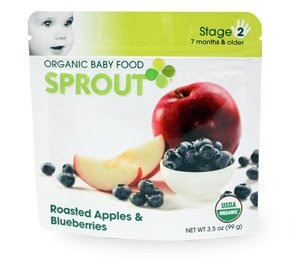 my baby will be eating baby food before I know it and this would be AMAZING! I'm thinking the Roasted Bananas and Mango and sweet potatoes! my son would love banana and mango flavor. he loves bananas! probably the roasted pear – they all sound so delicious! The apple and blueberry sounds great! I like the roasted cinnamon applesauce oatmeal, but they all sound good! Thanks for the opportunity! Little Mack will love Oatmeal with Roasted Cinnamon Applesauce!!!! !